Unique design for easy stacking. Slanted door design for easy access to contents. Crystal clear construction for easy identification of contents. Features non-skid rubber feet to prevent the unit from slipping. This food case, mini candy bin is a must have addition to any candy store, ice-cream shop, bakery, cafeteria or breakfast buffet. 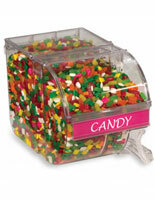 Specially designed with a modernized shape, this mini candy bin is perfect for commercial or home use. 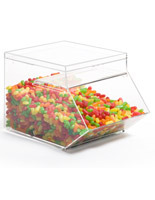 We manufacture this mini candy bin from durable acrylic to last for a long time. 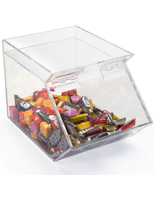 This acrylic display, mini candy bin is an ideal way to keep contents fresh and attractively displayed. 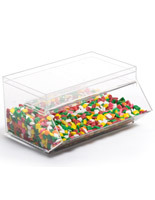 With the clear acrylic design, your customers should not have any problem viewing the contents of the mini candy bin. 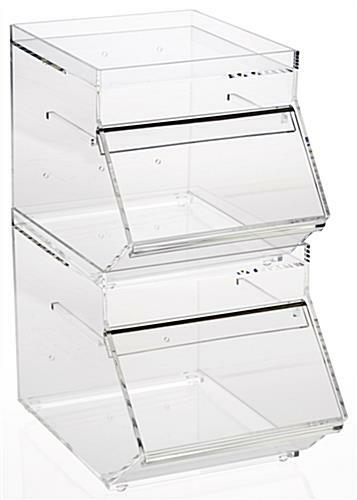 A mini acrylic candy bin also makes it easier for employees to know when the food item is running low, and its time to refill them. This mini candy bin has limitless possibilities! 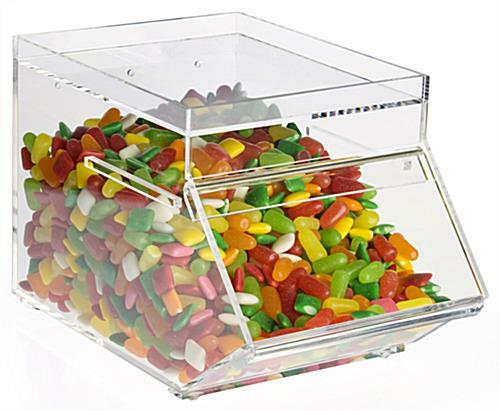 A mini acrylic candy bin can be used to store an assortment of dry goods such as candy, chocolates, gum balls and toppings. 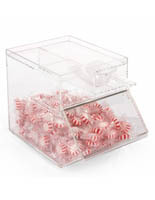 Fill up the mini acrylic candy bin with irresistible contents to draw customer's attention. 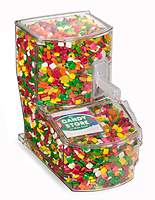 This mini candy bin is sure to delight both the young and old! 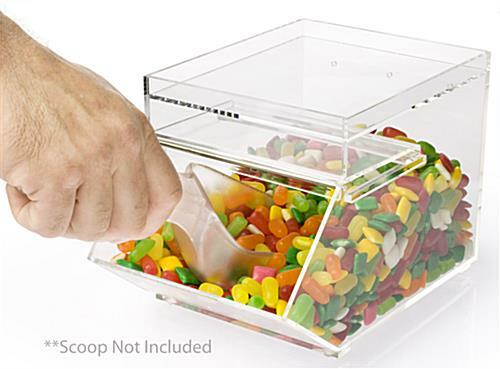 A mini candy bin, like mini food cases and countertop displays features a hinged lid for easy access. The mini bin hinged door opens upward and rests on the rail to keep the door from sliding down for easy and convenient access. 6.1" x 6.4" x 9.5"
Packaging is awesome quality is great and they hold a 5lb bag of candy pretty easily. Just which they were cheaper and a little longer depth wise but I think the 1.5 Gal shoudl work for my next purchase. Thanks! These are good space savers, we use them to hold wrapped bulk candies. Displays2Go ships very fast and the packaging is amazing. We have ordered several acrylic items and they always arrive intact and unscratched. I would say that they overpack, but that's only because I have a ton of wrapping to dispose of when I am done. But in the case of acrylics, the overpacking is the only way to go and I have confidence in their product every time.